When we exercise it breaks our muscles down forcing an adaptation by the body to get stronger. The key to successfully triggering that adaptation is recovery and as much as we think all supplements are the same, well they are not. The best trainers in the world will all tell you that you will only progress as much as you are able to recover, in other words, recovery is a key element in bridging strength or weakness. By adding the right nutrients to your body then it bridges that gap and gives you the ability to recover quicker and get better results which is an essential part of this process. Onnit’s Recovery Protein is designed specifically with recovery as it’s key focus. The key amino acids in this formula help repair muscle tissue, while also providing hydration from Coconut Water help keep you nourished and ready for more. Colostrum helps to modulate a healthy immune system, and creatine helps support the health of muscle fibers and the recruitment of available energy. Hemp seed, including at 10 grams per serving, provides well-balanced protein profile to complement the other protein sources in this supplement such as Goat Whey. 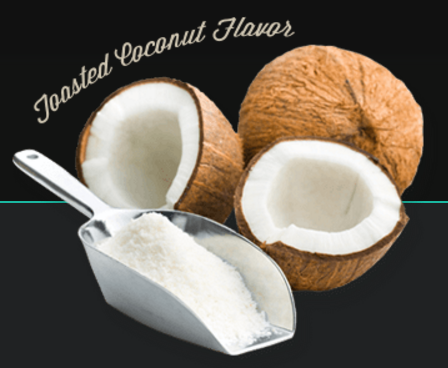 Coconut water is known for its ability to pack a hydrating punch, and in this formula boosts the delicious toasted coconut flavor. Creatine has been known for years to help in workouts and aid in gaining physical strength or even just toning your body. It helps the body with the synthesis of muscle fibers, helps support muscle health, and improves available energy output. Onnit’s new Recovery Protein is the best protein out to date that helps with fast recovery and muscle growth due to the ability for your body to get the proper nutrients along with proper hydration and having low lactose resulting in a reduced risk of unwanted body fat or belly fat. It has less lactose, fat, and fewer calories which helps it produce the best bang for your buck. I mix these three ingredients together to get my main protein from the Recovery Protein from Onnit labs, the Dolce Whey for a quick absorbing protein, and the Silk milk as the filler or the base for no added lactose. This gives me the nutrients that I need and helps my body get the fastest recovery that it possibly can. All of this together is my best way to build or maintain muscle and not gain anything unwanted weight. Wow…such a great tasting protein and well-given nutrients that help aid in cell recovery. Truly something new but truly something valuable. Price is $39.95 plus you get another 20% off the first purchase. I personally get the a tub about once every 2 to 4 weeks depending on how I workout and if during a workout I get really fatigued and it generally lasts me about one month and that is with me making a shake for breakfast in the morning on those days when I have had a good workout the night before. Give Onnit’s new Recovery Protein a try, I am sure you will love it as much as I do. Wonderful information that you have provided.I am deeply connected to the articles about health as am doing a course of nursing , so I highly appreciate your article as it gave me a clue on how to increase the protein in the body. Thank you for providing the key components of protein recovery. Thank you for your interest in Onnit’s Recovery Protein and good to hear from you, if there is anything that I can help out with please let me know. 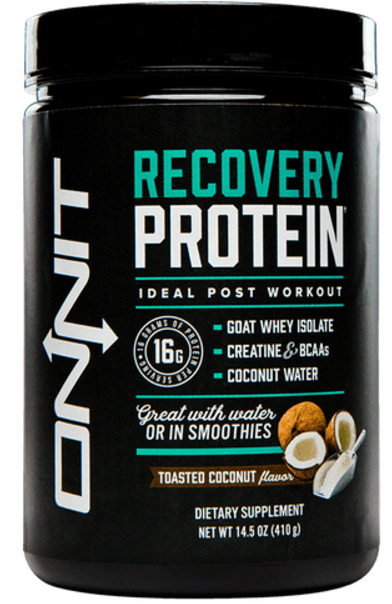 Do you plan on trying out Onnit’s Recovery Protein? Very informative and interesting product review which I’m going to share with my husband, an aerobics instructor. Currently, we make plant-based nutrition drinks every morning containing protein, greens, vitamins/minerals, fiber, omega-3, antioxidants and probiotics. Would you still recommend your protein recovery drink after workouts? I’m wondering if we should use both or if it would be overkill. I recommend that the Recovery Protein is best for an after or pre-workout but is best for post workout, as it has creatine, amino acids, and coconut which will benefit recovery along with the best plant based protein that can be consumed. Hemp is one of the best proteins due to it being very easy to digest which is important in absorption. Give Onnit’s Recovery Protein a try and let me know what you think, I would love to hear back from you and I am sure that you will love it as much as I do. Thanks for the very useful information! I have never seen this product before, and after looking at your website, I would like to give it a try. I had many other protein drinks but I mixed them with cow’s milk, and I am trying to reduce my dairy intake. I saw your recipes, and the coconut and almond milk sound like a great idea. Glad to help, I have personally used the Recovery Protein for a few weeks now and love it. I’m sure that you will as well. This is one of Onnit’s newest products and honestly I think they hit another straight out the box. Recovery Protein is truly great. I love when I learn something new, and I had no idea that goat’s milk molecular structure was close to the molecular structure of human milk. However, it makes sense as that is the only animal milk lactose intolerant people are allowed to drink. 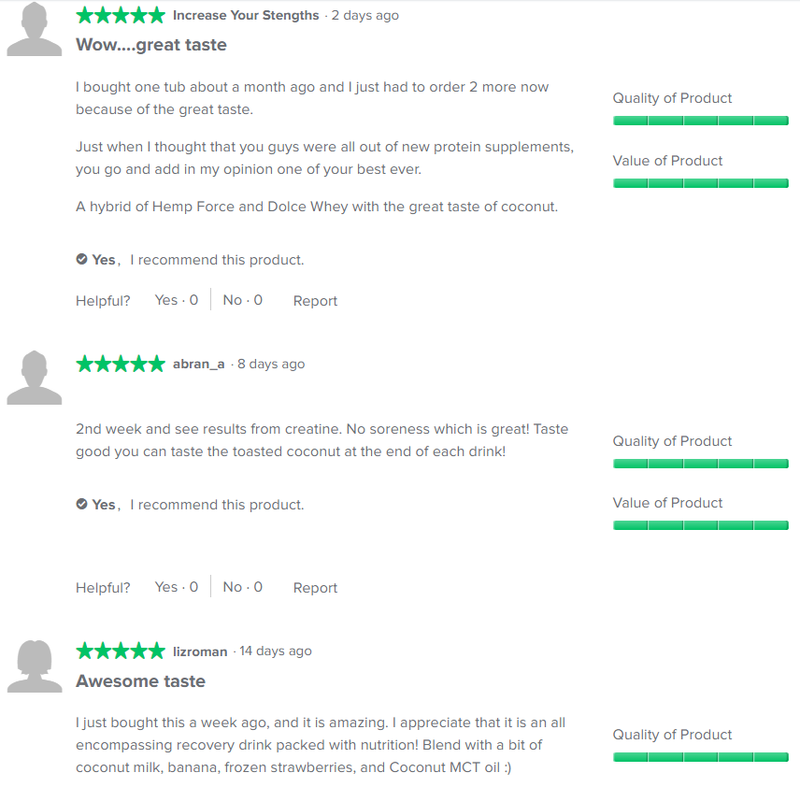 I appreciate the review as I am always trying to find a protein powder that incorporates the benefits of nature, in particular, coconut water. I also like that you have recommended a protein powder that I can use without the worry of gaining weight. Great to hear from you and I am glad you like the review, I have been using the Recovery Protein for a few weeks now… really ever since it came out and its great. The mix of coconut really helps the taste and it it great for the proper nutrients for recovery. I very seldom use products for recovery after training sessions. The information supplied here can go a long way to sustained training sessions complimented by your recovery recommendations. I’m of the opinion that my problem with muscle cramps may be the result of not recovering properly after long training sessions. I agree, we tend to want results so bad sometimes that we forget the importance of the proper nutrients after a workout and how it aids us in reaching our goals. This can lead to getting burned out and not putting the required effort into reaching your goals. Self doubt is hard enough, we don’t need to add to it by not getting to proper rest of nutrients and this is why I recommended the Recovery Protein to aid in faster recovery and a better quality nutrient. Thank you for this informational blog. I really enjoyed learning about how Onnit’s recovery protein can help optimize my workouts. I’ve been searching for a good protein mix and I think I can try this. It’s very affordable and I love the few drink mixes you added at the bottom. I can totally get on board with that morning shake including dolce. Thanks for stopping in and if I can assist in any way please let me know, I am glad that you enjoyed the post on Onnit’s new Recovery Protein and I am sure you will enjoy it even more once you get yours in the mail. For someone who works out as much as I do, I know the importance in taking in a sufficient amount of protein every day to maintain lean body mass. People always complain that their skinny but its all because you may not eat enough protein to help maintain that muscle. If you don’t have enough carbs as well you won’t feel full. I completely agree, I used to workout all the time and would wonder why I couldn’t gain any muscle or why I stayed so sore. I was strong but I was skinny and if I stopped working out for a few days then my strength would decrease. This is all because I was not giving my body the proper nutrients, there are so many people with opinions about health and fitness but truth be told unless you have the experiences or the data to back it up then talk is cheap. Hi very happy to see your website and it is very informative. I must thank you that I got more informative ideas about how to increase protein in our body. The Recipe explained are very useful and good. I love your website. Is Recovery Protein taken best after a workout? Have you had get the best results? Thanks for the kind words, I have been able to accomplish great things with my health and fitness so I decided to try to reach out to as many people as I can. Not all things work for everyone but there are a lot a common things that help everyone and honestly those fake miracle pills that they promote and people buy are truly a waste but somehow they a great promoters of their products. This type stuff hurts people like myself and companies like Onnit labs that are trying to truly help people achieve their goals and try to give nothing but the very best products to aid in proper nutrients. I have been using the Recovery Protein for a few weeks now and truly love it, I hope you make decision to give it a try and I am sure you will love it. Indeed, eating is a science. Vegetables, milk, fruits, meat and all kinds of grains are importants. In fact, I eat as I like, I think it’s difficult for me to use an exact quantity. The important thing is to eat all kinds of food, do you think so? I agree that eating correctly is the best thing that we can do but in today’s world it is very hard to get the proper nutrients from what is put in our direct view. Meaning the fast food places and really most of the foods that are in most grocery stores. It can be a challenge in itself just trying to find good quality foods so this is why I have a products section on this website that only shows the very best quality supplements that you can get for whatever your need is at the time. Onnit labs offer only the best and all fully tested products to make sure that they give their customers the best product that they possibly can, give the products section a look and please let know if there is anything that I can do to help out. Interesting review. I’ve used protein shakes for general health and wellness, but never really considered a shake for recovery specifically, although it does make sense. Your article convinced me that it’s worth trying, especially after some strenuous workouts. I’ll let you know how I get on, although if you’ve used this product and seen results, I’m confident it will add what’s missing to my strength training. Thanks! Thanks for your interest in Onnit’s Recovery protein, I have found that it has helped me in fast recovery and in having the proper nutrients so I don’t get nearly as sore after a good workout. I still get sore so don’t get me wrong but not near as such. The Recovery Protein from Onnit and along with my morning shake has really helped me in so many ways. Lacking protein has been a huge concern of mine at age 56 and also cleaning carpets and upholstery and re-stretching carpet with a knee kicker. Just writing all that down is making me feel tired lol. This energy and recovery product sounds great! And it’s coconut flavored too? I’m sold! Here’s looking forward to more energy and recovery days ahead. Life is too busy to be feeling run down and tired after working for a living. Nice to hear from you and yes it is one of the only proteins that put these key ingredients together with the flavor of coconut which I might add is my favorite flavor. I would love to her how much you like it after you give it a try. I do a smoothie fast every few month and add protein powder to it. I was wondering if this would be a great replacement to the protein powder I am already using. I don’t do any heavy workouts during this time because of the limit on my diet at that time. I have been using the Recovery protein for 2 months now I love it. It is a very good supplement for protein and other natural nutrients. You do not have to have a heavy workout to enjoy the benefits of Onnit’s Recovery Protein. Hello here, you have a comprehensive website. There is so much information. Proteins have the important function in the cells as structure elements. They maintain cell shape. Enzymes are the different type of protein, but they are important for metabolic processes. This mixture sounds as a good option for people who exercise and would like to grow muscles. I like mixtures for smoothies and drinks because it is easy to prepare and it gives the body needed elements. I wonder from where manufacturers got colostrum? I guess that it is expensive and not easily obtained ingredient. The proper protein is very important to getting the best results and yes, Onnit labs does the very best to produce only top quality products for anyone that is serious about getting in shape or even just being healthy. The benefits far out weigh any of the competition or products that they make, there are a lot of companies that try to sell low quality products at high quality prices, lucky for us, Onnit labs believe in producing the very best quality at a low price. Onnit’s Recovery Protein sounds very revolutionary! It has so many natural ingredient used and it doesn’t seem like it can give you serious side effects. Plus it’s soy free and gluten free, which makes it great for dieters. This kinda seems like the 100% healthy alternative to Gatorade or Powerade. All without the garbage and sugar etc. Great job! Nice to hear from you and yes Onnit labs stays trying to bring the absolute best to us so that we can reach our optimal state. Recovery proteins is gluten free and soy free which help out in ways that most people do not even realize as in today’s food contains a lot of gluten which clogs your pours and makes it hard to have healthy skin or even sweat properly. I use Onnit’s Recovery Protein and I truly love the taste along with enjoying the benefits of the nutrient value that it has.